One of the Mediterranean’s best-kept secrets, Corsica was once known as Kalliste, 'the most beautiful': a fitting tribute to its stunning Caribbean-style beaches, rugged mountains and legendary maquis wilderness. Two centuries of French ownership have diminished none of the island's strong national pride and on a holiday in Corsica, you’ll discover how much there is to be proud of. An extraordinary history is evident in its ancient citadels and lies along the twisting coastal roads that take you into traditional villages and glamorous towns reminiscent of a 1960s' Bond film. Luxury lies in the exclusivity of Corsica and our luxury villas, apartments, and boutique hotels have been chosen to help you make the most of it. The largest of our island destinations offers a hundred different summer holidays in one, less than three hours from the UK. Imbued with the French sophistication and more than a hint of Italian glamour, luxury holidays in Corsica draw on the richness of its history, culture and unspoilt landscape. From pristine white sandy beaches to dramatic mountain scenery, cosmopolitan harbour towns to ancient hilltop villas, vineyards to boutiques, you’ll find tradition rubbing shoulders with a 21st-century appreciation for the finer things in life. Set in an idyllic countryside of olive and fruit groves, vineyards and tiny hilltop villages, holidays in the Balagne, the Garden of Corsica, have a very special flavour. Calvi is a highlight: a walled citadel on an outcrop of granite that marries historic cobbled streets, a gently shelving sandy beach and vibrant contemporary culture. The spectacular heart of the island claims some of its most magnificent scenery, from the forests of Castagniccia to the gorges of the Restonica Valley. 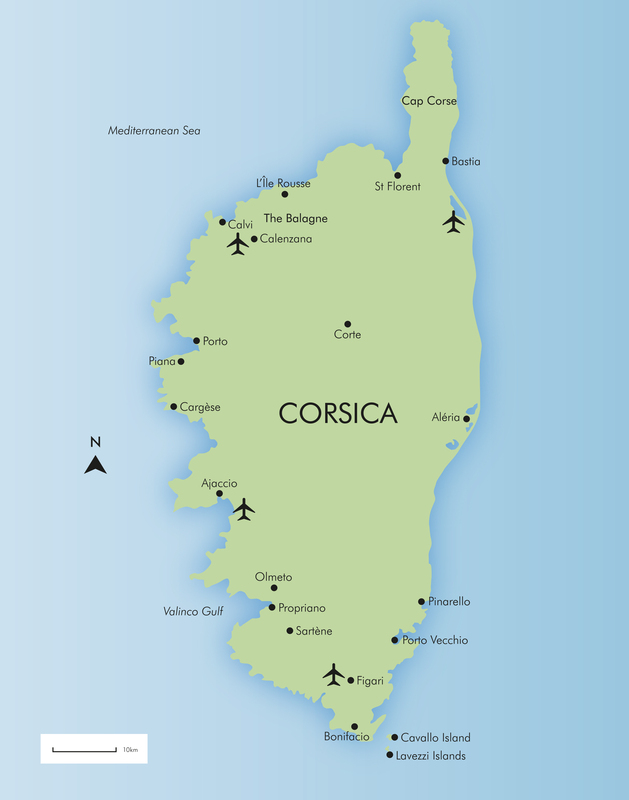 Brooding Corte is ideally located for exploring the Corsican Parc Naturel, while Aléria is rich in history yet within easy reach of the quieter east coast beaches. Near the Caribbean-style beaches of the south, the elegant towns of Porto Vecchio and Bonifacio are infused with Italian charm, yet have a uniquely Corsican feel. Their ancient cobbled streets are dotted with cafés, boutiques and restaurants – a contrast to the romantic villages, mountains and lush countryside further inland. Journeying north, discover St Florent, a town with a distinctly French character. Set against a backdrop of misty lavender mountains and basking at the neck of Cap Corse looking out on its azure gulf, the nearby vineyards of Nebbiu and Patrimonio produce excellent local wines. Loved for its pristine beaches and watersports, The Gulf of Valinco is home to one of Corsica’s oldest resorts, chic Propriano, which still retains much of its former fishing village authenticity. Filitosa, one of Europe’s most important prehistoric sites and home to the famous menhirs, lies in the countryside nearby. Sheltered by tree-covered hills, Ajaccio, Corsica’s capital and the birthplace of Napoleon, is the main attraction on Corsica’s West Coast – a town of pastel-coloured façades and a palm-trees bordered waterfront. However, follow the jagged coastline north and you’ll discover the dramatic UNESCO-protected Gulf of Porto.